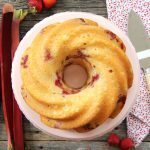 Use an 8 cup Bundt pan. Prep your Bundt pan by spraying the inside of the pan with a baking spray containing flour (you can find this spray in the baking aisle at your grocery store). This step is so important if you want your cake to slide out of the pan. Set aside. In a bowl combine the chopped strawberries and rhubarb with the cinnamon and sugar. Set aside. In another bowl, using a mixer, cream together the butter and sugar. In another bowl, mix together the milk and yogurt. To the butter mix, add 1/3 of the flour mix, then 1/2 the yogurt/milk mix. Repeat until all combined. Put clumps of the cake batter around the bottom of the pan, followed with the strawberry rhubarb mixture, and repeat until finished. Let cool for about 10 minutes in the pan, then turn the cake out onto a plate.